Editor’s Note: Justin Malaise grew up in small-town Wisconsin as a star three-sport high school athlete. One month after graduation, a car accident left him in a wheelchair forcing him to forgo his plans of playing college ball. After spending the entire summer in the hospital, Malaise left home for college without having had the time to adjust to his new life as a paraplegic. I’m not a person who gets depressed. I know there are some people who go through a pretty deep depression after an accident, but I don’t know if I spent more than a minute thinking about my injury. It was just the hand that was dealt. I knew I was lucky to be alive, and I just moved forward. My first year of college was tough, though. I was not ready to be out on my own. I was still in a back brace, so my mobility was horrible. After making it through that year, I went back home for the summer. I had a free weight set that I had bought in high school, and all I did, other than hanging out with friends, was lift weights four or five days a week. It just gave me something to do, and I wanted to get back into the jock mentality that I had before. When I went back to school that fall, I had access to a basic weight room, so I continued lifting. I survived college and got a degree in applied mathematics. When I started working full-time, I kept lifting at nearby gyms. I recently bought a pretty extensive setup for my house. I have a full free weight cage and weights to go with it. Having equipment at home works really well for me. It’s a huge time saver and allows me to get my workout in first thing in the morning. 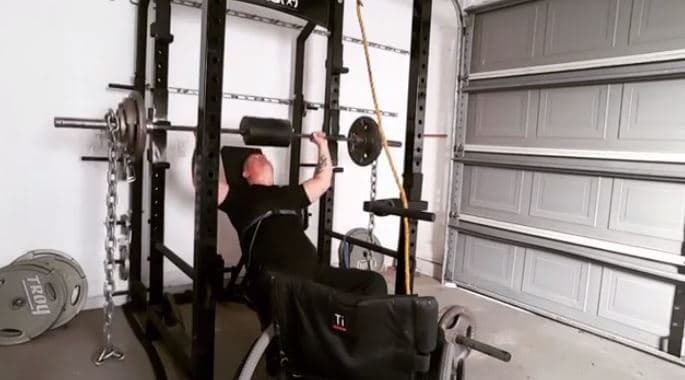 For someone in a wheelchair who wants to start working out but doesn’t have any background in fitness, looking for information on the internet can actually be harmful. There’s a lot of garbage out there. 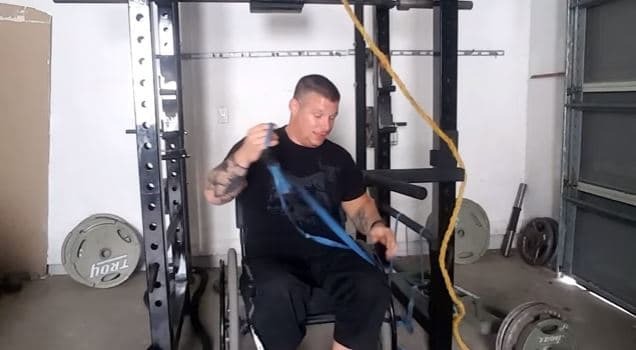 On my site, MalaiseWheelchairFitness.com, I take some of the basics and show people how to set up, how to do the exercises safely, and how to secure yourself. I focus on demonstrating and writing about using free weights for people with injuries similar to mine. For anybody with full use of their arms, there is no reason why we shouldn’t be able to do lifts that involve heavy weights. Our upper bodies are much stronger than the average person because of all of the pressing and pulling we do on a daily basis. All of my workout videos on my site and social media are filmed at my home. My setup is nothing different than what you’d see at a typical gym. The lifts I’m doing now on my home setup are the same lifts I did at gyms for 18 years. What’s nice about it is that you can max out on your own, because there are safety bars. 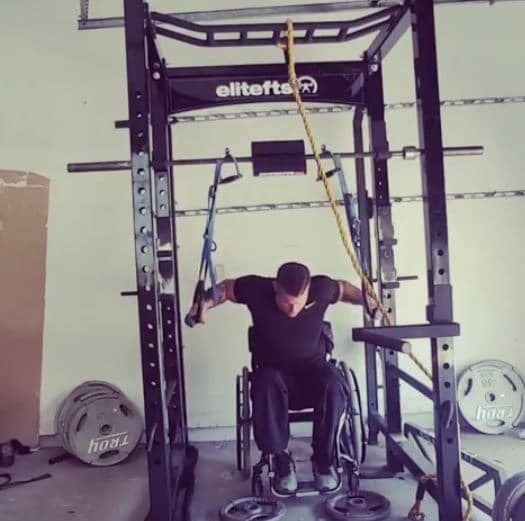 Cages exist for safety reasons; if you’re going to fail the lift, the risk of injury is minimal, because the weight will land on the safety bar. As a wheelchair user, getting out from under the bar is a little tricky. 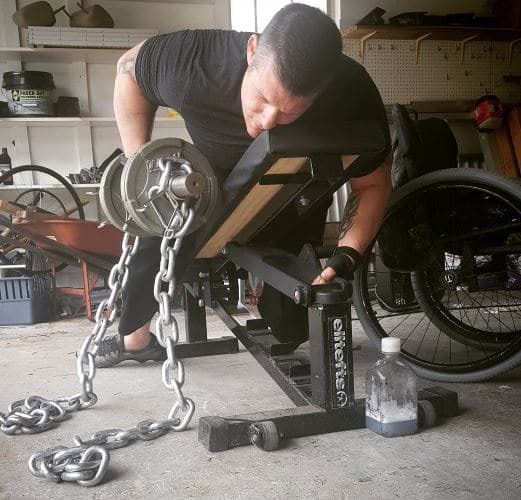 You might have to go to the floor to get back to your chair, but if you’re strong enough to lift that much weight, you can find a way to manage. 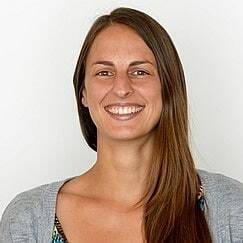 When I started the site, I wanted to be able to get information out there, but I knew I needed some credibility. I have unique knowledge, and anyone that has been in my situation will have the same unique knowledge that comes from trial and error, but I wanted to couple it with a credible certification so my readers know I’m not just making stuff up. I went with the Certified Physical Preparation Specialist (CPPS) certification, because it’s about applying very sport-specific and high-level athletic training concepts for regular people. Even if you’re not a professional athlete, there’s no reason why you can’t train like one. CPPS takes some of those principles and applies them to people like myself who are very competitive and like a challenge. It was a good fit for what I like to do and how I like to lift. The human body is not made to sit around. For physical and mental health, we need to move our bodies. The endorphin rush that comes from a workout is real. 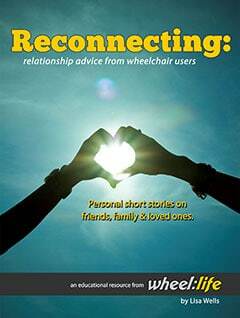 A big moment for anybody in a wheelchair is regaining independence. For example, when a wheelchair user is able to drive a car again with hand controls, that’s huge. They get a big chunk of their independence back. 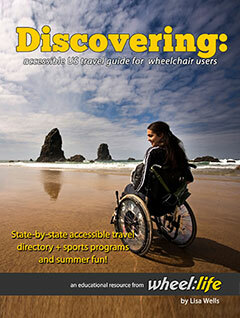 Part of what I try to promote on my site is that if you’re able to get stronger as a wheelchair user, the number of things you can do with your fun time opens up dramatically. That might mean being able to get in and out of a pool on your own, or in my case, because I’m strong, getting on and off my Harley by myself. That’s the whole point — build your strength and endurance so you’re able to do more stuff. You get a better quality of life. One of the reasons I got my home gym is because I like to workout in the morning to get it out of the way. Sometimes life happens and your evenings get caught up with work or whatever, but I know that everyday I work out in the morning is going to be a good day. It gives me a sense of accomplishment. No matter what happens with this day, I got a good workout in. There can be a downside to lifting as well, because really heavy weight can put your spine in danger. I like to lift heavy, but I just don’t want to put my spine through anything over 350 pounds. Building strength is great, but it’s about overall health as well. 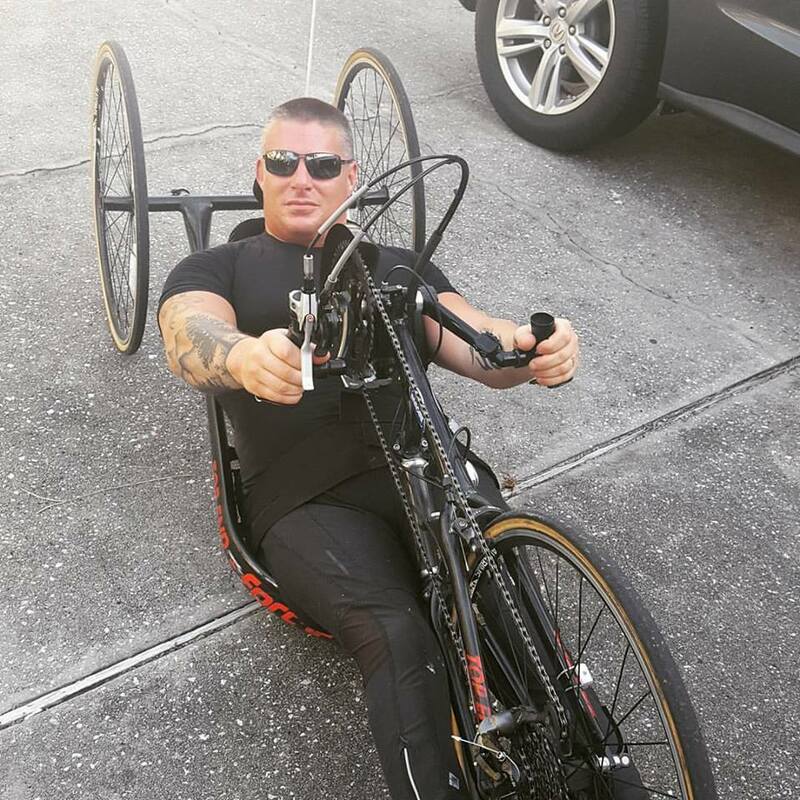 That’s why I also do handcycle marathons and work on my cardio. I’ve always been an active person, so I have troubles understanding the desire to be inactive. One thing I can say is that if you like to eat, make working out your friend, because you can eat a whole lot more of what you want. Also, you’re just going to feel better about yourself if you make working out a regular activity in your life. I guarantee you’re going to be happier. 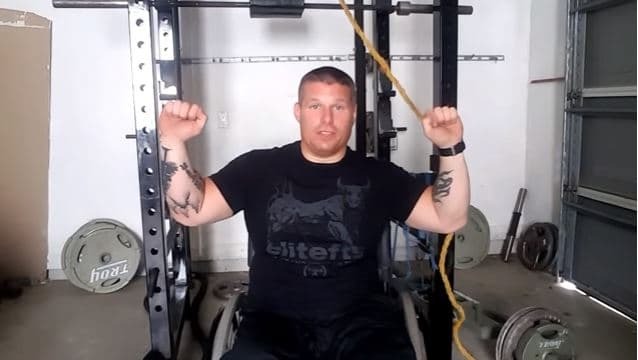 Editor’s Note: Follow Malaise Wheelchair Fitness for training and nutrition tips and be the first to know about the release of his upcoming ebook on wheelchair fitness for beginners. 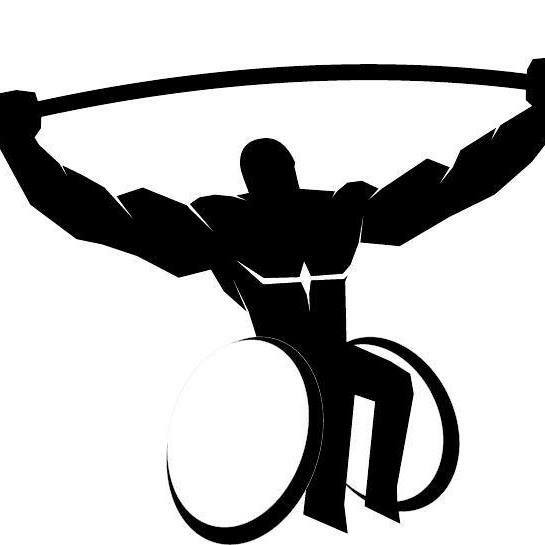 Visit his website at MalaiseWheelchairFitness.com. You can also follow him on Facebook, Twitter, and Instagram.